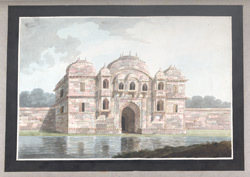 Watercolour of the fort at Ramnagar, Uttar Pradesh, part of the Wellesley albums, created by an anonymous artist working in the Calcutta style, c. 1798-1804. The Marquis of Wellesley was Governor General of India from 1798 to 1805. In that time he amassed a large collection of art, consisting mainly of natural history drawings. Ramnagar Palace is situated on the right bank of the Ganges River and was made the capital of the former princely state of Benares (Varanasi) by Raja Balwant Singh (r. 1739-1770) in 1750. The fortress of Ramnagar was constructed mostly by this Raja, who governed the province of Benares on behalf of the Nawabs of Avadh (Oudh). The rebellion of his son Chait Singh in 1781 against the exactions of the East India Company caused the province to be annexed by the Company. The palace was later returned to the family, who became known as the Maharajas of Benares.